I don’t really have a favourite coffee shop. For me, a coffee shop is a place to rest, a place to wait between meetings, a place to have meetings, to meet friends. The best coffee shop is one that is in the right location (except for Starbucks, which has the same atmosphere as a production line in a factory). But this coffee shop is my “location coffee shop” when there are events at my daughters school. Many years ago, my brother & I spent a few years wandering around Southern Europe and Eastern Africa. You couldn’t call it travelling, really, since we rarely planned where we going. One day we woke up in Cairo, fresh off sailing a felucca down the Nile for a week or so. We had seen as much of the pyramids, souks, markets and sights as we really needed and it was time to move on. At breakfast we met some other guys who had just arrived from Jordan, simply bursting to tell us how fantastic Petra was with its amazing buildings carved into living rock (as seen on Raiders of the Lost Ark). We decided to go there. Packed up and headed to the bus station without giving any further thought to it. The bus station was busy, and we had to wait 10 hours to catch a bus and it wasn’t until we got Al Ismailiyah that we realised our mistake. It was Ramadan when many people would visit their families and celebrate the festival together. The passenger queue for a ferry across the Suez Canal has several thousand people after a breakdown at the start of the busiest period of the year. It was the second day of patiently sitting in the heat that the drink seller came around.In the 45ºC heat, this man was walking around with a insulated box, filled with ice, soft drinks and water. We started bantering with him in broken english and our few arabic phrases, and joked that what we really needed was beer. How I remember this next moment. He broke into a beatific smile, spat out a laugh and string of arabic words before diving into his coolbox and fishing around before holding out two bottles of ice-cold, frosty, luscious beer. I swear that the choirs of heaven were singing songs from the vestibule at this moment. My mouth watered to touch the cold liquid, to feel those little angels of beery goodness dancing across my tongue. Mouths watering, my brother and I dove for our dinars to buy his entire stock. We drank the first beer while standing there, surrounded by thousands of people who had queued for two days to catch the boat to Jordan. In those days, Egyptian pilsener was quite awful but amid the smell of sweat, desert heat, open fires, overflowing toilets and endless impatience, I had the best beer I’ve ever had. What I learned was that it is not the beer that matters, its the context. This matters more than anything. 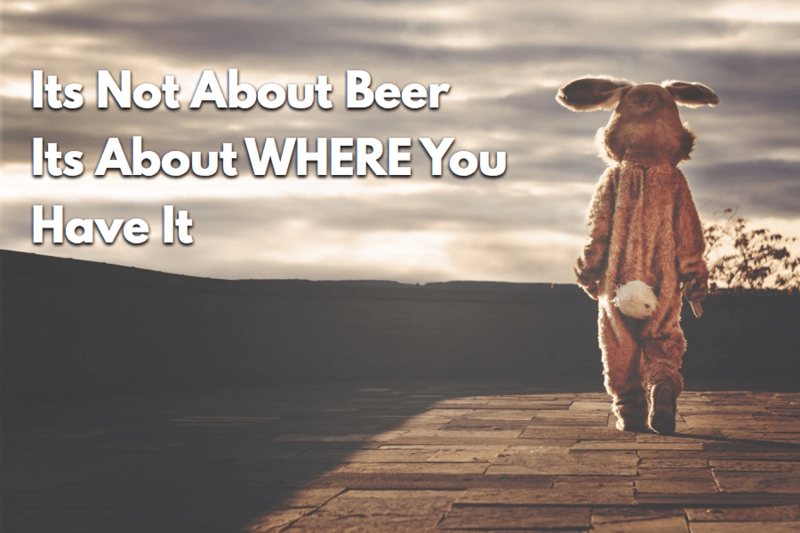 Its about why you had the beer ? What led up to the moment ? Thats why I don’t really have favourites. Everything is relative. Thats why I don’t have a favourite coffee shop. But I do have my location coffee shops.